Stacy Lambe: Is Media Heading Towards the BuzzFeed Model? Cleantech Group: "2012 investment in water and wastewater will double over 2011"
We received an email with the above graphic from the Cleantech Group and thought it was worth passing along. 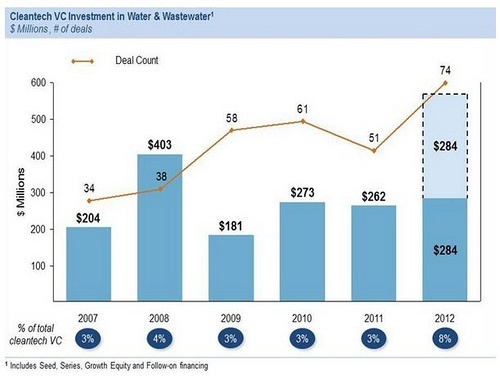 The main point is that "[a]n influx of investment in late stage water companies is set to make 2012 the strongest year yet in terms of VC investments." Also of interest is that "wastewater treatment technologies are getting over half of the global funds invested in water in 2012." All in all, based on that information, this definitely looks like a sector to keep our eyes on in coming years. IEA Executive Director: "A clean energy transition is still possible." The Executive Director of the International Energy Agency (IEA), Maria van der Hoeven, has some encouraging thoughts on the transition to a clean energy economy that are worth highlighting. 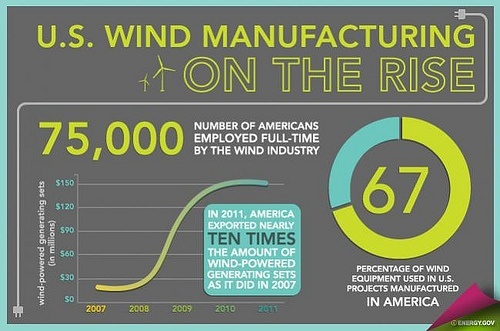 This morning, the U.S. Department of Energy (DOE) released a new report on the current state of wind power in the United States, including trends through 2011. DOE Press Secretary Damien LaVera highlighted, on Twitter, several key findings from the report. Sunday NY Times Magazine Explains "The Secret to Solar Power"
Bill Clinton: "We ought to have, those of us in this green energy field...a tattoo test"
Earlier this week, the 5th annual National Clean Energy Summit was held in Las Vegas, Nevada. The summit featured an extremely impressive list of speakers, including former President Bill Clinton, Senate Majority Leader Harry Reid, Interior Secretary Ken Salazar, former ARPA-E Director Dr. Arun Majumdar, Peter Fox-Penner of the Brattle Group, “Revenge of the Electric Car” director Chris Paine, plus numerous other clean energy leaders, innovators, policymakers and thinkers. We highlighted many of these in blog posts (see here here, here, and here). You're laughin', but I'm tellin' the truth and you know it. You should have seen it. I mean, it was amazing. I stopped-- I shook hands with hundreds of people today. I asked 'em their stories. I talked to 'em. They got what they were doing. It's a huge solar thermal operation. There are gonna be, I think-- 173,000 flat panel,thin panel solar reflectors beaming up to a tower over 350 feet above the earth, turning water into steam, running the steam down back to the bottom of the tower, and turning turbines. And-- it's truly impressive. But we could have a hundred of 'em and not just one or two...And these people were so proud...Once people see sustainable economics as the primary instrument of people havin' somethin' to look forward to when they get up in the morning, we are on the way home. Clinton makes several good points here, as he often does. Overall, though, what Clinton's remarks do is to underscore the need to take real-world solar success stories like Ivanpah, and to multiply them exponentially. If we do, we will see solar power creating not just jobs - for people both with or without tattoos - but new careers, ones that give people "somethin' to look forward to when they get up in the morning. " And, as President Clinton points out, the more people - not just clean energy wonks and specialists in the field, but blue collar, working people with "tattoos" as well - can articulate the many benefits of clean, large-scale power, the more elected officials will hear the message, and ultimately take action to support it. Time Magazine Highlights the "Clean Energy Revolution"
Over the past few days, there's been a lot of talk by leading political figures - speaking in bellwether, "swing states" like Colorado, Nevada, and Iowa - about the Production Tax Credit (PTC) for wind. More broadly, the discussion has revolved around the economic potential for clean energy development in those states, as well as in the country as a whole. Clearly, clean energy has become a political issue with potential "juice;" as a recent poll found that "57 percent of [Iowa] voters, including 41 percent of GOPers, [would be] less likely to support a presidential hopeful who isn't for expanding [wind] power," with "85 percent of the state's voters see[ing wind] as positive for Iowa." Is energy efficiency condemned to be the “eat your peas” technology? It’s hard to argue with the idea that energy efficiency is the most under-told part of America’s clean energy economy, despite the efforts to date of some pretty smart, committed people. We could go such a long way to cutting our use of the most destructive forms of energy and addressing global climate disruption if we just stopped wasting so much. Video: Sen. Reid - "It is easy to see the logic, the urgency and the opportunity of a clean energy revolution"
As the saying goes, a picture speaks a thousand words, and this case is certainly no exception. 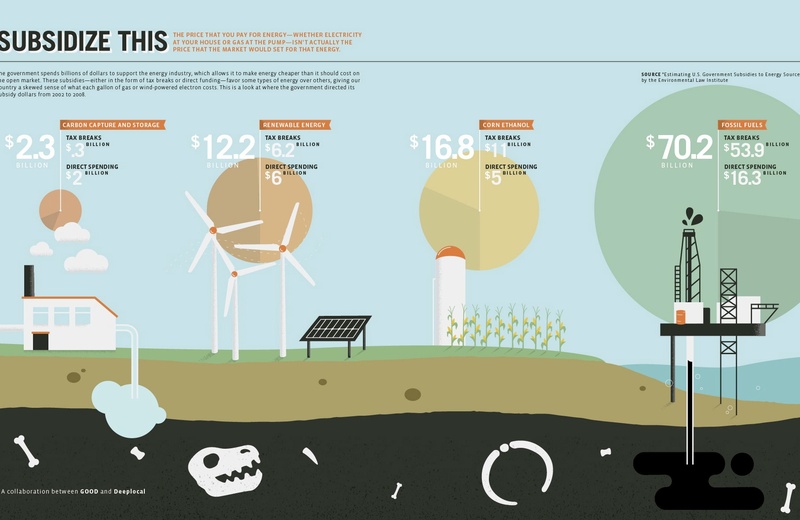 Thanks to Greentechmedia and to GOOD magazine and graphics partner DeepLocal for powerfully illustrating, in one concise infographic (click on the image above for a larger version), "just how stuffed the fossil fuel industry has gotten on government tax breaks and cash handouts, while the much smaller share of federal backing that goes to renewable energy has been the target of congressional investigations." As the statistics clearly show, it's not even close. In addition to the announcement of a 150-MW wind power project in Nevada - the first wind farm in that state - Denise Bode of the American Wind Energy Association had an exciting announcement of her own. According to Bode, the U.S. wind industry has now "installed 50 GW of total electric generating capacity...enough to power 13 million typical American households - as many as in Nevada, Colorado, Wisconsin, Virginia, Alabama and Connecticut combined...as much as 11 typical nuclear plants or 44 coal powered plants." Impressive! Finds "inadequate enforcement guarantees irresponsible oil and gas development in New York"
New Study: Ongoing, Future Effects of Gulf Oil Spill "major," "scary"
A new study provides more evidence of why we badly need to move away from dirty fossil fuels - and the toxic chemicals used to process them, clean them up when they spill, etc. - and towards clean, renewable energy as rapidly as possible. 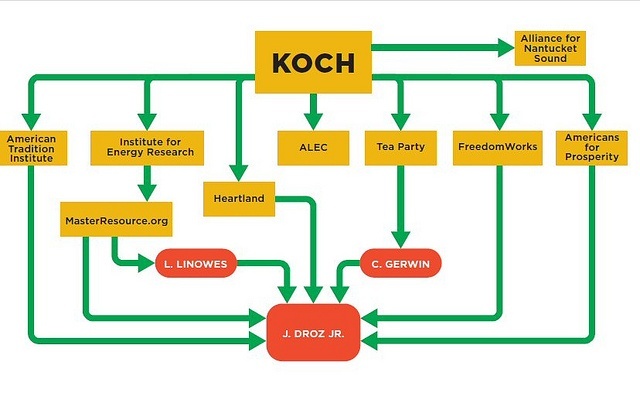 A story in today's Energywire caught our eye, as a classic example of the lengths to which powerful fossil fuel companies will go to stifle any look into their operations.